Fire is elemental. It is so elemental evolutionary biologists claim that it has been burned into our DNA to respond to it. When seated around a campfire, our blood pressure decreases. It soothes us, and sustains us. For millennia, we have worked on mastering fire. One place this is most evident is in the cave paintings at Lascaux. Artists at Lascaux used fire to see inside caves, but the glow and flicker of flames may also have been integral to the stories the paintings told.” (http://nautil.us/issue/11/light/early-humans-made-animated-art). This is the season when we see the two side by side. Winter frosts compel us to build a fire in the fireplace. Hearth and home would not be the same without the comfort fire can bring, and the refuge it provides from the frigid outdoors. Like moths to a flame, we can’t help but be drawn to fire. Few things are more soothing than to be curled up on a nice wingback chair with a mug of cocoa in front of the fire. 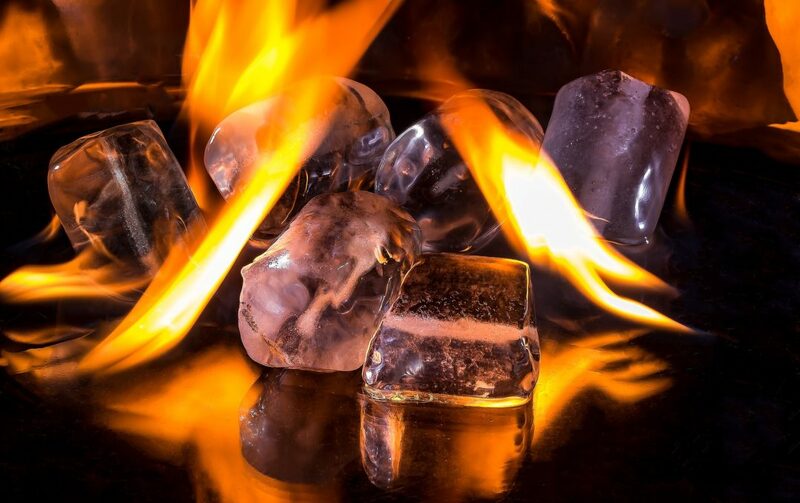 However, as Robert Frost warns fire and ice can be destructive. We have witnessed the destruction fires can cause on center stage in California this year. However, in the hands of someone who can tame its flames, fire can produce a beauty beyond compare. I speak of the master flame painter Ron Kamerlink. Armed with only a blowtorch, Kamerlink uses copper as his canvas, and, relying on the elements to create mesmerizing colors, he creates incredible works of art ranging in size from small wearable art pieces (earrings and necklace pendants) to huge machine-sized works like the piece he created for Coppermine Winery. Ron’s flame painting journey began after a special piece of jewelry caught his wife’s eye when they were traveling. They purchased the piece and after examining it they thought ‘we can do this’! 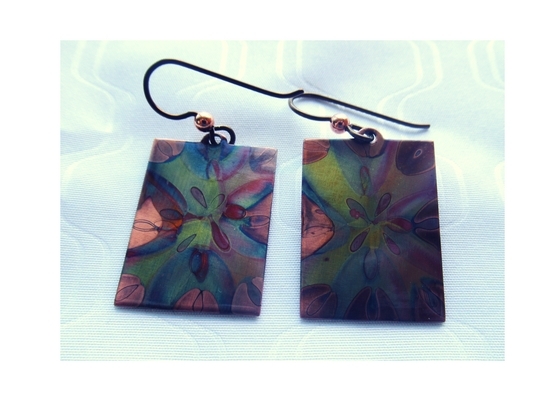 As Ron began soldering copper for jewelry he was entranced by the colors the flames made on the copper, and what was once a simple mechanism for connecting jewelry pieces, started to take center stage as he began to use his blow torch as a paintbrush. 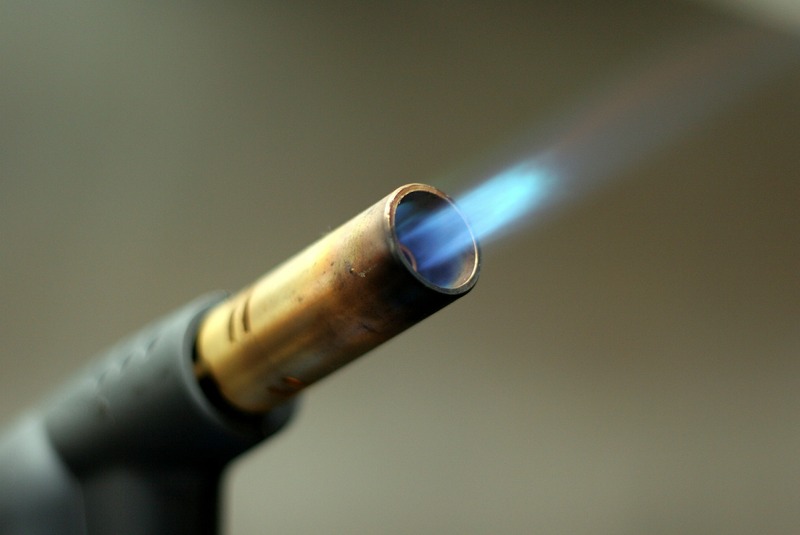 According to Ron, “The various colors are caused by the continuous heating of the copper with a small tip oxy-propane torch. The heat brings different oxides of the copper to the surface. There are 7 or 8 different colors that come out at different temperatures.” But, it’s difficult to achieve color variation. 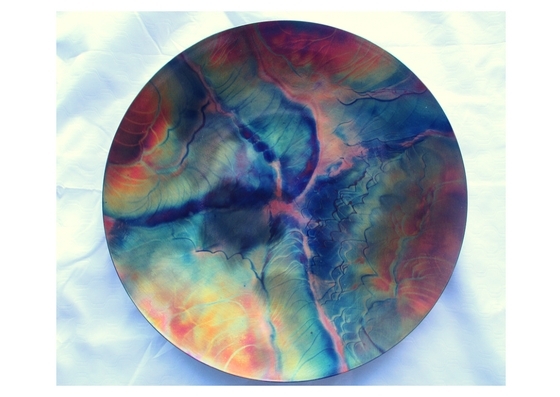 As Ron puts it “there is a very large learning curve to know when to ease off on the heat.” The challenge of developing the full range of colors on every piece whether it be an 18-inch platter or a 3/4-inch earring is what motivates Ron and sparks his creativity. Ron’s muse is Mother Nature, and he is fortunate to be surrounded by beautiful mountains, rivers, and trees in Murphy’s. It is a natural wonder that still fascinates and awes Ron each time he reaches for his blowtorch and “coaxes forth the beautiful colors present in copper”. You can find Ron’s flame painted artwork and jewelry at Art on Main, Studio Seven Arts, Indigeny Reserve, The Dolphin, and Coppermine Winery.